Will this deal go wrong, or will INTU Properties shares rise even further? 4 Oct: Brookfield Consortium (Brookfield, Peel, Olayan) confirm mulling cash offer for Intu Properties. Let’s say you think that INTU Properties is likely to rise further as a result of a takeover offer, towards the 255p highs around the turn of the year. You decide to buy exposure to £10,000 worth of INTU Properties using a CFD, at the current price of 196p. To do this, you need £2,000. For the purpose of this example, let’s assume the INTU Properties share price rises by 10%. Your profit would be £1000, from your initial investment of £2,000. Conversely, let’s assume you open the above position, and place a stop-loss at 5% from the current price. 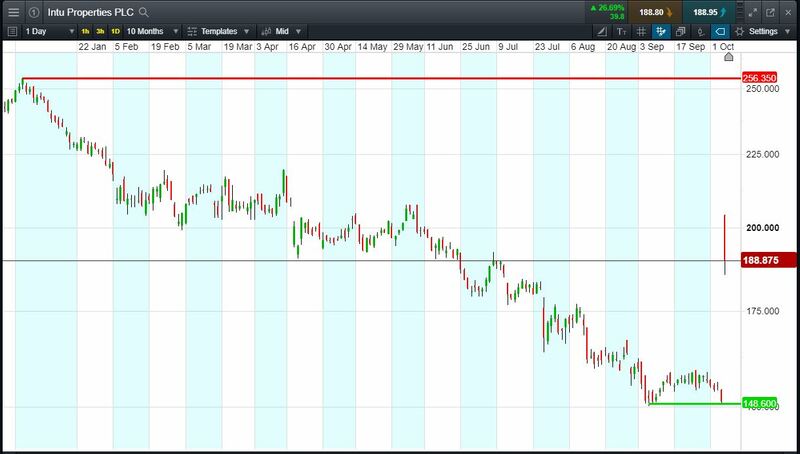 Sentiment towards the deal sours and INTU Properties shares fall 5% and hit your stop-loss. Your loss would be £500.